Sports, great food, and friends are the trifecta of any great weekend! Triple this assemblage and you have March Madness – three weeks of unrelenting win or go home excitement of the greatest tournament in the country. These three weeks are the embodiment of everything good, right, smoked, charred, marinated, rubbed, rotisserie, seared, skewered, and caramelized. To carry your game day menus through the big tournament, here is our series Grill Madness, featuring Grilled Buffalo Chicken Sliders for a tangy and spicy variation on a pub classic. For these sliders, we use boneless chicken thighs cut in half, and marinated for hours in Frank’s RedHot sauce and butter. To counter the beautiful burning spice, the sliders will be topped with a refreshing slaw of carrots, celery, sour cream, blue cheese, and scallions. 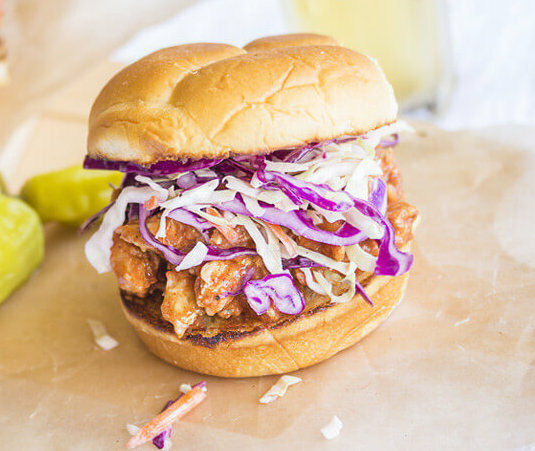 As the chicken soaks up the sharp vinegar and rich butter, the slaw adds a cool and creamy lightness that balances each bite. Serve on toasted slider buns, and get ready to scream, eat, sweat, drink, and repeat through all 60-plus games. So fire up the grill, get face paint for your alma mater, and let’s celebrate Grill Madness. Heat a grill pan or outdoor grill to medium high (about 375°F to 425°F). Meanwhile, make the slaw. Peel the carrots and grate them on the large holes of a box grater; transfer to a large bowl. Halve the celery stalks lengthwise, very thinly slice them crosswise, and add to the bowl. Add the sour cream, blue cheese, hot sauce, and scallion and stir to combine. Set aside while you grill the chicken. When the grill is ready, remove the chicken from the marinade, letting any excess drip off, and discard the marinade. Place the chicken on the grill and close the grill. Cook, flipping the chicken after about 4 minutes. Continue cooking until cooked through, about 3 to 4 minutes more. Remove to a clean plate and tent with foil. Place the buns cut-side down on the grill and toast until grill marks appear on the bottom, about 1 to 2 minutes.